This was published on Cameron's website. 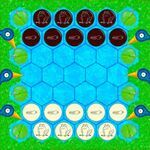 You could print out the board, and nine copies of the white and black piece sides, then affix them to checkers, coins, or each other. Cameron's graphics from this edition would later be used in the nestorgames edition.